신부 임미영양과 신랑 송민휘군의 결혼식에 오신걸 환영합니다. 특히 먼길을 찾아 이자리에 참석해주신 모든분들께 진심으로 감사드리며 기쁨과 행복을 나눌 수 있는 즐거운 시간이 되시길 바랍니다. Welcome to Mi Young and Minwhi’s marriage at St. Chrysostom’s Church. We especially welcome those who have travelled long distances to be here for this joyful day. 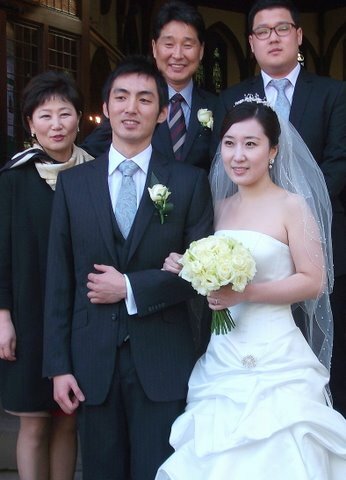 And some had travelled incredibly long distances – from as far afield as new Zealand, for Min and Miyoung’s wedding. It was a lovely celebration. We were delighted the wedding was at St Chrysostom’s where Byunghee, proprietor of Soeul Kimchi, has worshiped for several years. Cellist friends entertained the guests as they arrived and set the atmosphere and then as Miyoung arrived Min himself serenaded her playing his cello. A traditional wedding followed, with well known hymns, including, Love Divine and O Perfect love. The reading from St John’s Gospel, read in Korean, reminded us of the centrality of love, and Fr Ian spoke in his address of how love is creative and inspirational in our lives and how we are to celebrate it and encourage it as a gift of God. The prayers were said. The nuptial blessing given, and the registers signed. Then, when photos had been taken, we all gathered in the space at the back of church and enjoyed together lovely Korean food and wine, as, once more the musicians played. The Best Man gave his speech, we raised our glasses to bride and groom. Then a lovely surprise, Min and Miyoung had slipped away for a while to change into beautiful Korean national dress, which added special colour to a lovely day.